Thermage is the only non-invasive procedure for skin tightening and skin contouring that takes place in a single treatment with no injections and no downtime. 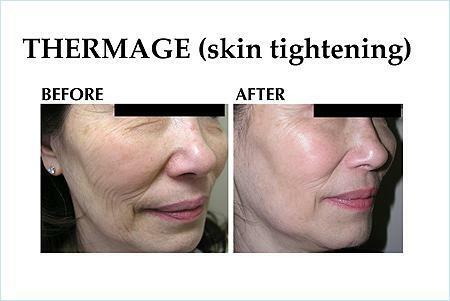 With Thermge skin firming and tightening loose skin will give you softened wrinkles and lines and overall younger looking appearance. Thermage works by heating deep collagen fibers in the skin and underlying tissue, while protecting the skin's surface with a cooling spray. Deep uniform heating action causes the deep structures in the skin and underlying tissue to immediately tighten. Over time, new and remodeled collagen is produced to further tighten skin and renew facial contours. Thermage can be used safely on areas of skin laxity on the face or body. We have treated faces, necks, chests, elbows, knees, abdomens, and even labia majora (outer vaginal lips). Generally, some improvement is immediately visible and continues up to six months. Results can last for years depending on your skin condition and aging process. We have been performing Thermage since 2003 and have performed well over 1000 treatments. There is a big advance and potency with our new January 2013 version. Almost twice the energy level, greater efficacy and less feeling of heat. There is no bruising, swelling or sutures, you can apply make-up and return to your normal routine after the procedure. 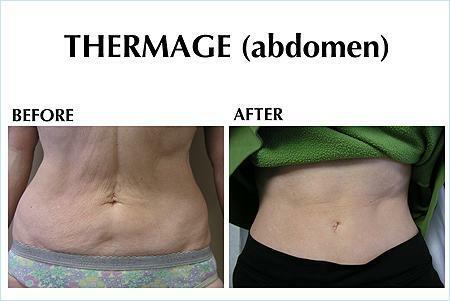 To find out more about Thermage in the Woodland Hills or Beverly Hills areas of Los Angeles, please contact us.